Preheat oven to 350F. Lightly grease a 9x13-inch baking pan, or line with parchment paper. In a large bowl, cream together sugar and butter, until fluffy. Beat in egg and vanilla extract. Working at a low speed, gradually beat in flour and salt until mixture is crumbly, like wet sand. The dough does not need to come together. Pour crumbly dough into prepared pan and press into an even layer. Preheat oven to 300F. Spread coconut evenly on a parchment-lined baking sheet (preferably one with sides) and toast 20 minutes, stirring every 5 minutes, until coconut is golden. Cool on baking sheet, stirring occasionally. Set aside. Place caramels, salt, and milk in a small saucepan. Heat over medium-low heat, stirring frequently, until the caramels have melted and everything has come together as one mixture. Fold in the toasted coconut. Spread the caramel mixture evenly over the cooled crust. Allow to cool completely before cutting. 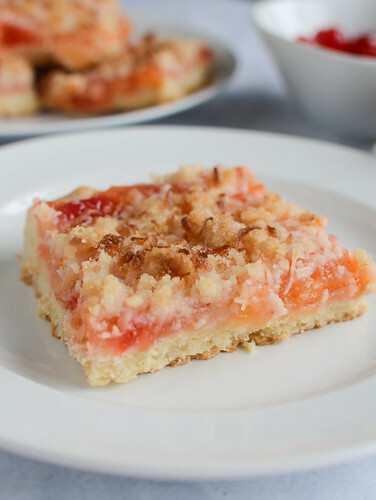 Cut into 30 bars with a large knife or a pizza cutter (it's easy to get it through the topping). Once bars are cut, melt chocolate in a double boiler, a heatproof bowl set over simmering water, or a microwave. Once melted, allow to cool slightly and then transfer to a pastry bag with a small round tip (or ziploc bag - cut a corner off after the chocolate is in) and drizzle over tops of bars. Store in an airtight container once chocolate is set. 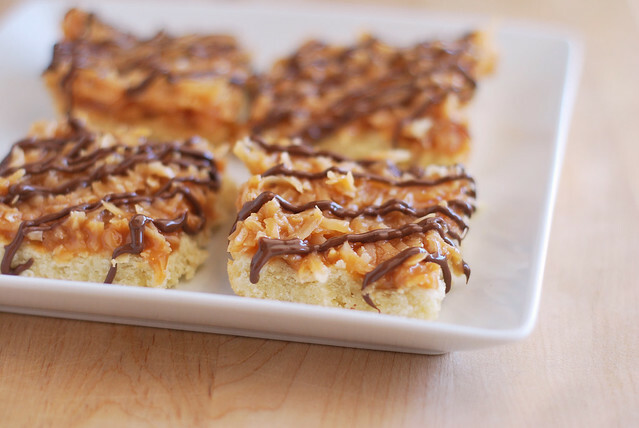 36 Responses to "Samoas Bars"
Hmmm – these look to die for. They are seriously making me drool right now. Thankfully here in NYC, Girl Scouts don’t stand on corners selling cookies otherwise I’d be in serious trouble. I have deep-seated love of these cookies. The bars look fantastic! I am totally going to have to make them to fulfill my cookie craving that you’ve now spurred! My favorite girl scout cookie…looks so wonderful. Oh my goodness, Girls Scouts on every corner? Where do you live!? I can’t find the Girl Scouts anywhere here! 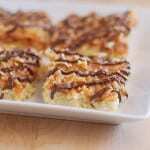 I love samoas and if I don’t find those girls soon, I’ll be trying out your recipe. It looks delicious! I could go for these right now! Im a little chocolate-ed out but still want something sweet. These look great! Samoas are my favorite GS cookies. This take on them looks easy to make and so delicious! My husband’s favorite GS cookie. If I tell him about this he’ll be begging me to bake them! yum these look sooo good! Oh my goodness, I was so excited to see this recipe. I’ve lived overseas since 2004 and sorely miss Girl Scout cookies, but especially Samoas. I can hardly wait to try this out! You already know I’ve been planning those for a while. Totally cracked me up when you made them. I’m surprised you’re already seeing girl scouts where you live. I think it’ll be a few more weeks before we start seeing them up here… and I agree, it’ll be very hard to walk by them without buying at least a box. I’ve gotta get myself in the kitchen and mix up a batch so I have a reason to not buy a $4 box of cookies. Do you think homemade caramel would work instead? just came across your blog! its gorgeous! i love the pictures :) those looks fabulous! I was a girl scout for years, and I am still a sucker for samoas! This recipe sounds great! I cannot believe this but I just stumbled this post. I was just eating a GS Samoa and said I need a recipe to make these homemade! 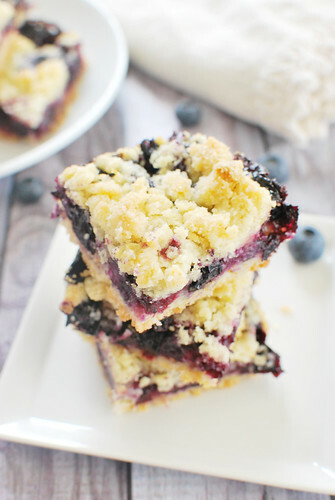 It’s bookmarked now and i’ll be sure to link to you when I make these…yum! I’m not sure whether or not to be thankful or sad for my waistline. Thank god this recipe exists. And what perfect timing to stumble upon it, I was just beginning to go through Samosas withdrawals! Thanks for sharing this great recipe! 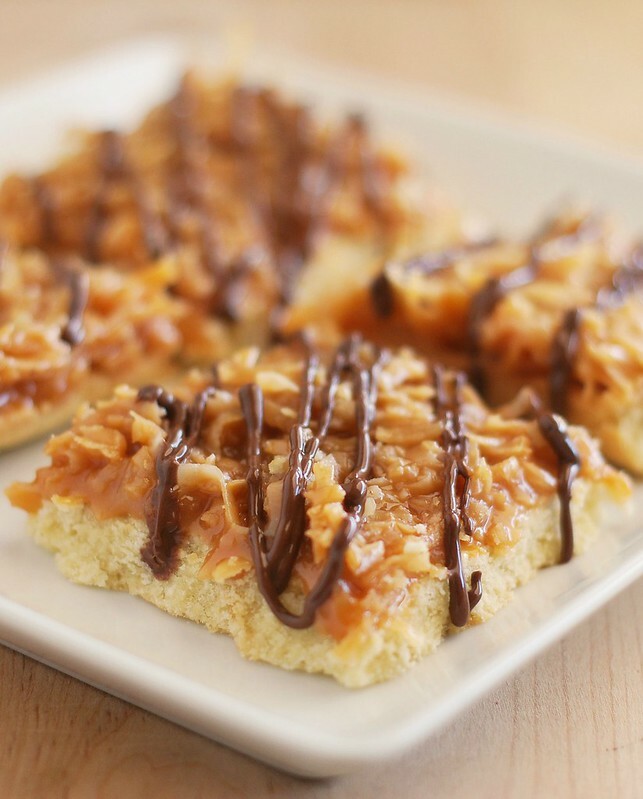 Samoas have got to be my favorite girl scout cookies, this is a great new twist on the classic. So, after a 2 day hunt for caramels, I made these. They turned out really, really great! Thank you, Amanda for posting!!! These are totally bookmarked as an upcoming need to do recipe! I love your blog and have given you the Stylish Blogger Award! Hereâ€™s the deets: http://bit.ly/fdFGmc Congrats!! I can’t wait to make these! Did you use sweetened or unsweetened coconut? 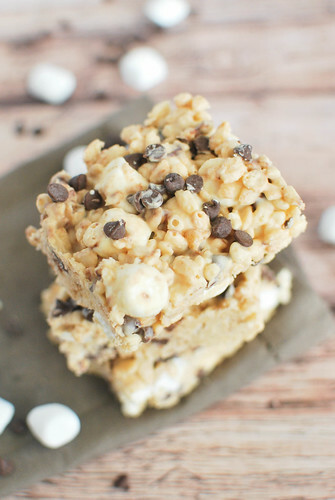 These bars look amazing- I love Girl Scout cookie-inspired recipes :) Pinning! I didn’t buy any cookies these year.